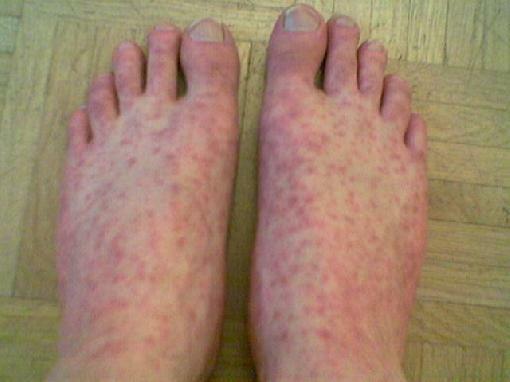 Lupus is an autoimmune disease that can present in the feet and is often misdiagnosed early on. The incidence of lupus and other autoimmune diseases is high in the US. Early symptoms may include pains in the feet and temperature sensitivity that causes the toes to turn bluish in color. The meds used to treat lupus can also have effects on your feet including making you more prone to infections including warts, bacterial infections, nail changes and infections and skin changes that may predispose to wounds developing. “Raynauds” phenomenon is a condition common to 25% of lupus patients that causes a spasm in the blood vessels in the toes limiting blood flow and causing pain. The nails can form small pits in the surface and sometimes mimic a fungal infection. Skin atrophy may cause increased pressure to the bottom of the foot with calluses or ulcers a result. Joint pains may be accompanied by degenerative changes within the joints. If you have any or all of the symptoms see your doctor who can order a blood test to check for lupus and other auto immune diseases.